Wristroller Exercise apparatus comprising an elongate body, a weight supported by a lanyard depending from the elongate body, and first and second stops carried by the elongate body each in substantially abutting relation against one of either side of the lanyard, wherein a user may grasp and rotate the elongate body to raise and lower the weight as the lanyard is wound and unwound about the elongate body with the first and second stops cooperating to force the lanyard to wind and unwind about the elongate body upon itself. This is a Utility Patent, not you typical design patent. The wristroller has been around for over 60 years. The Wristroller is used for all sports and Physical rehabilitation. 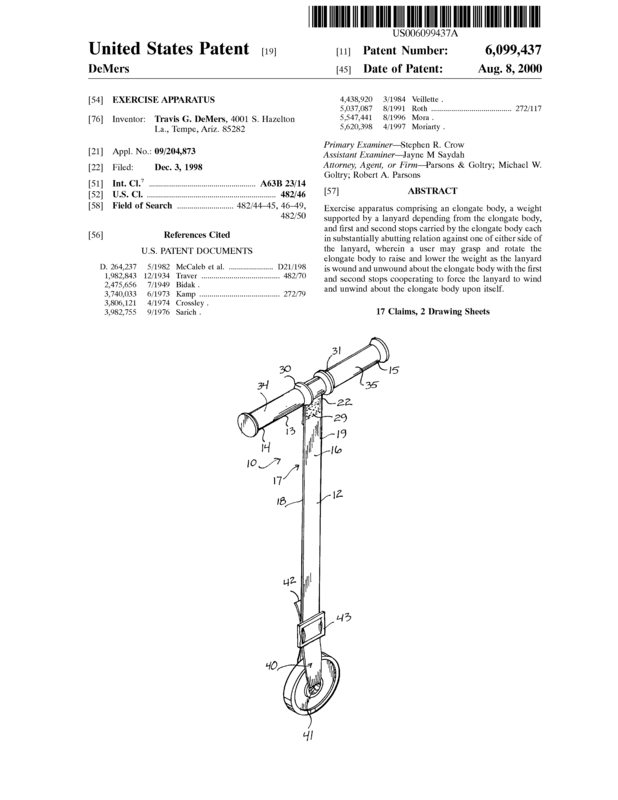 The wristroller has not changed much until this patent. The wristroller is used by standing with arms extended straight out, by turning the handle you raise the attached weights, and then slowly lower it back down multiple times. The wristroller builds you grip, wrists, arms and shoulders. It is used by therapists for Carpal Tunnell, hand, wrists, arms and other various injuries. The wristroller is very well known, this patent takes a similar home made product and takes it to the next level. 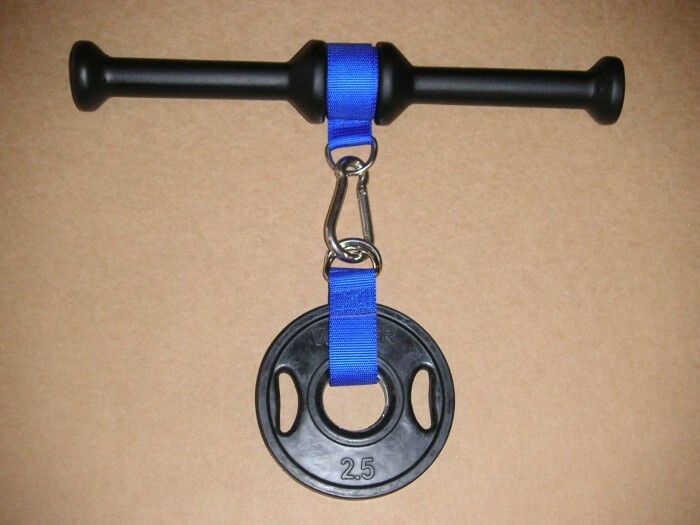 This patent uses a flat webbing material in the center that winds upon itself as the weight is raised, the center stops keep the material centered, not allowing it to move from side to side. The Wrist Roller is very well known, well used product that has been around for over 60 years. The Wristroller is used for all sports and Physical rehabilitation. This product has been marketed extensively in the USA in most major Sports, Fitness and Health magazines. Most marketing has been towards Golf, Tennis and Junior Hockey and Baseball. Many products are sent overseas to the military service members. There are product molds that may be included that cost about $60,000.00 that have been made. 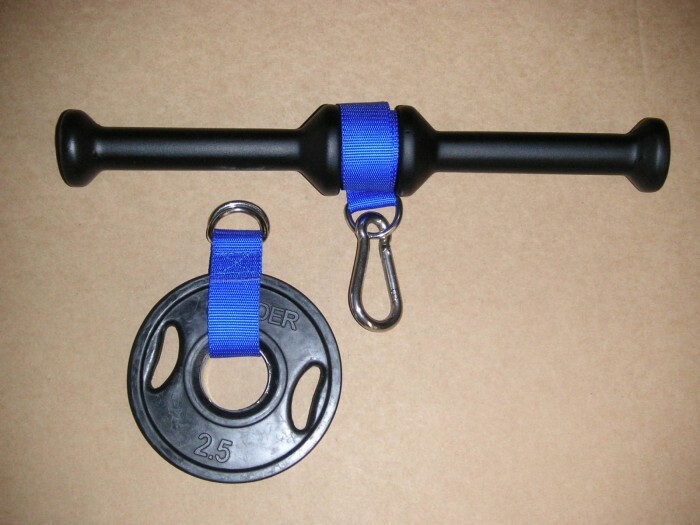 There is also a new (unreleased) product designed for gyms/fitness centers that will be disclosed upon reaching and closing of a successful deal. The wristroller is sold in many Health and Fitness department stores, but are limited in their design. Again this is a true UTILITY patent, not a simple design patent. Seller financing for a small portion may be available. Page created at 2019-04-25 4:26:13, Patent Auction Time.